In September, we published an article on the basics of donor-advised funds (DAFs), outlining why this giving vehicle is important, how it works, and what types of sponsoring organizations can manage DAFs. Now, we’re following up with a blog focused on DAF holders, answering an important question for today’s development officers: how do I work with and engage this donor segment? In general, building relationships with supporters who have DAFs is no different than cultivating any other donor at a comparable giving level; all the usual rules apply. If they shared their personal information with you, gratitude and stewardship are both key. Communicating the impact of their gift and striving to match their interests with your organizational mission should be high on your priority list. Still, DAFs are a unique giving vehicle, and there are several ways you can adapt your practices and strategies to appeal to DAF holders. Read on for our top recommendations. Connect with your local community foundation. A philanthropic adviser at the community foundation in your city or region is a direct link to DAF holders. They work closely with DAF holders, understand the donors’ interests, and can ultimately recommend your nonprofit. Consider this a networking opportunity for you and your organization. Reach out, introduce yourself, and ask for a meeting. This is your chance to educate the philanthropic adviser on your organization and learn about their priorities. Some foundations hold special events to bring donors and nonprofits together, so building relationships with officers can also ensure you’re up-to-date on any important gatherings and opportunities. Make it easy for donors to recommend DAF grants to your organization. On your giving webpage, include information about giving from a DAF to make the process transparent and easy for prospective donors. Among other resources, Seattle Symphony maintains an FAQ page for donor-advised funds. On its website, The Nature Conservancy offers clear information about its own DAF, as well as giving through DAFs sponsored by other organizations. Both organizations include “contact us” options for visitors with additional questions. Adding the DAF Direct widget on your website’s giving page is another simple way to streamline the DAF granting process to your organization. Fidelity Charitable created this widget, but it also currently coordinates grant recommendations from two other sponsors: Schwab Charitable and the BNY Mellon Charitable Gift Fund. DAF Direct allows donors to contribute to your organization from their DAF account with just a few clicks, rather than having to go through their account managers. By including the widget, you’re also signaling that you understand DAFs and have experience handling grants from them. In general, make sure that the DAF granting process to your organization is as frictionless as possible, both for DAF holders and account managers. This means communicating clearly with DAF holders about how they can use their fund to contribute to various projects and sharing all relevant paperwork. Don’t be afraid to reach out to DAF holders with more than one ask in a year. You can use the tax structure of DAFs to your advantage. Once a DAF holder makes a gift to their fund, they receive immediate tax benefits, so they aren’t motivated to recommend grants based on seasonal giving and tax deductions. Additionally, your supporters who use DAFs have already indicated that they take philanthropy seriously. They are committed to your organization and are strategic with their gifts. If your organization has a pressing need, reach out—don’t feel constricted by traditional giving seasons. 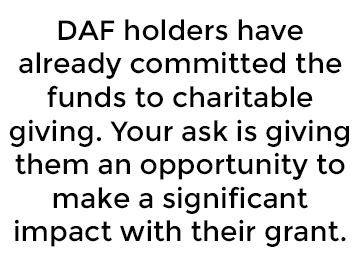 The bottom line: DAF holders have already committed the funds to charitable giving. Your ask is giving them an opportunity to make a significant impact with their grant. Understand the rules that govern how DAFs can be used. The IRS has specific rules for DAF usage. According to the IRS, the donor cannot receive any personal benefit from their gift. This means that donors cannot use their DAF accounts to purchase things like gala tickets or silent auction items, even though a large percentage of the cost would be contributed to the charitable cause. You should still invite DAF holders to participate, since donors can always choose to purchase a ticket in another way. It’s also important to note that DAF donors can’t sign a pledge form for DAF-based contributions because they are not the legal owner of their fund assets. Instead, offer these donors a letter of intent. In this way, they can signal that they plan to recommend a grant to fulfill their promise. Overall, keep in mind that, for many DAF holders, the DAF is only one mode of giving. These donors may choose to give from a personal account, so feel free to ask them if they’d like to contribute in another way. Use the correct language in thank-you notes for a DAF grant. When writing acknowledgment letters for contributions that came from a DAF, remember that DAF holders already received tax benefits prior to giving to your organization. Don’t include the standard language explaining that the gift is tax deductible. While this may seem like a small detail, sharing accurate information with your donors projects professionalism and shows that you understand how DAFs work and how to engage with all types of donors. Engaging supporters who have DAFs can feel intimidating, but donor-advised funds are simply another way people can choose to support your organization. DAF holders seek out organizations that align with their personal interests and give to causes they care about—just like the rest of your donors.